1. The 3rd drive bay of the TS-351 supports SSD caching. You can purchase 2.5-inch HDD/SSD drive tray bases from the QNAP Online Shop. 2. M.2 SSDs are sold separately. As M.2 SSD operations can easily generate excessive heat, it is recommended to install a heatsink on M.2 SSDs. With SSD prices continuing to become more affordable for home and small business users, there's never been a better time for using SSDs in your NAS to enjoy higher performance, faster file backups, smoother multimedia experiences, and optimized virtualization applications. The latest QTS 4.3.5 takes SSD functionality even further by supporting software-defined SSD RAID extra over-provisioning (OP) that enables you to allocate additional OP space from 1% to 60%, beneficial for optimal SSD random write speeds and extended lifespan with higher endurance. Now you can use affordable consumer SSDs for the TS-351, adjust the SSD OP, and potentially attain performance and endurance levels similar to enterprise-grade SSDs. Snapshots help protect your data by fully recording the NAS system state and metadata. Use Storage & Snapshots Manager or File Station to easily manage snapshots and quickly restore the system to a normal state if an error occurs. QNAP snapshots are block-based and only record the changed data. Not only does this save storage space but also reduces the time required to back up and restore data. The TS-351 with 4GB RAM can support up to 256 snapshots per NAS and 256 snapshots per volume/LUN. Have fun with your NAS! The TS-351 transforms how to enjoy your photos, music and videos throughout your home and beyond. It also supports 360-degree panorama photos and videos! Video Station's smart collection, advanced search, and easy sharing functions make it so easy to enjoy your videos. Spoiler alert: you can even import video information from multiple online databases! Whether accessing your media files on a computer or mobile device, you can enjoy a smooth playback experience. You can also connect the TS-351 directly to your TV or monitor via HDMI! You can watch Full HD 1080p media files on a HDTV using the HDMI output. The TS-351 features various media players provided by HybridDesk Station (HD Station) for playing media files stored within it. The TS-351 supports H.264 hardware decoding and real-time transcoding, allowing you to convert 1080p videos to universal file formats that can be smoothly played on multiple devices*. *The TS-351’s hardware provides H.264 hardware decoding, encoding and transcoding capabilities. However, playback quality may vary due to factors including playback software, file formats, system usage, and available bandwidth. Make the TS-351 your home multimedia hub to stream photos, music, and videos to computers, TVs, mobile devices, Apple TV®, Google Chromecast™ or DLNA® compatible devices. Install Plex® Media Server app to stream media files from NAS to your mobile devices, DLNA® compatible devices and HDTV by using common media streaming devices (including Roku®, Apple TV®, Google Chromecast™, and Amazon Fire TV®). Video HD is a free KODI™ add-on that combines KODI's streaming and video decoding capabilities and fully supports Video Station's features. The TS-351 provides the smartest NAS solution for professionally managing files by integrating rich apps for storing, synchronizing, searching, and archiving files. You can easily access files on various devices (including USB storage and mobile phones), instantly synchronize files with friends' and/or colleagues' devices, quickly find specific files, and automatically organize your documents and media files. The TS-351 helps save your time for a more productive and efficient life. 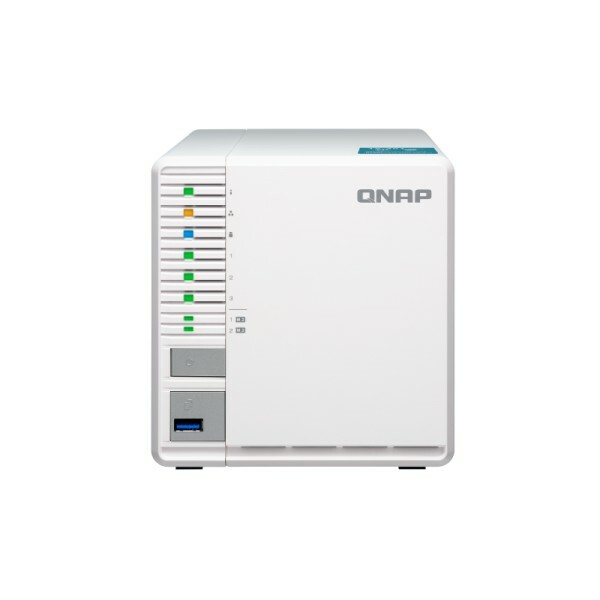 QNAP's Hybrid Backup Sync app centralizes backup, restoration and synchronization tasks for you to easily transfer the data stored in your TS-351 to remote servers, USB storage (via One-touch copy function), cloud storage, or another QNAP NAS. With Qsync, you can also access your NAS files from PCs, laptops or mobile devices connected with the TS-351 at any time. Backing up Windows® or Mac® data to the TS-351 is also effortless by using QNAP’s NetBak Replicator utility or Apple’s Time Machine®. QNAP’s new QVR Pro surveillance solution allows you to arrange a dedicated, independent storage space for surveillance data on the TS-351 and leverage the advantages of storage manageability from QTS. With QVR Pro, camera management, storage space allocation, camera live view and playback is greatly simplified. You can also use the QVR Pro Client mobile app to monitor your cameras from anywhere, or use USB webcams as ONVIF network cameras with the QUSBCam2 app. Use VJBOD (Virtual JBOD) to expand your storage capacity by using the unused storage of other QNAP NAS. Up to 8 QNAP NAS can be mounted as local disks on the TS-351.